You may have seen the movie “Groundhog Day” which was released in 1993. 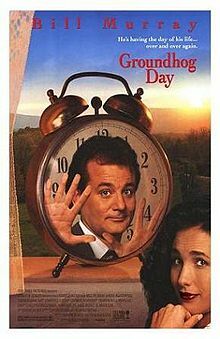 In the movie, Bill Murray plays weatherman Phil Connors who was sent to Punxsutawney , PA to cover Groundhog Day, only to find himself repeating the same day over and over again. No matter what he does, he can’t seem to escape Groundhog Day. The annual report from the Trustees of the Social Security Administration seems like its own version of Groundhog Day. Every report seems to be a repeat of the prior one. The reports warn of the coming insolvency of Social Security and Medicare, but it’s projected to be far enough into the future, that no one seems to worry too much. The 2012 report estimates the Social Security system will become insolvent in 2033, three years earlier than what was predicted a year ago. The fiscal status of Social Security has been known for years, yet Congress and President Obama reduced the employee’s contribution rate to the Social Security system from 6.2% to 4.2% for 2011 and 2012. The rate reduction was intended to stimulate the economy, and they argued it would have no long-term impact on the solvency of Social Security. Anyone with a rudimentary understanding of economics and finance could tell you paying less taxes into a system that is already paying out more than it receives, will have a negative effect. Only Washington politicians are surprised by the updated figures, or at least act surprised. The staunch defenders of this ridiculous argument also contend the system is solvent for more than the next two decades. They point to the trillions of dollars in the Social Security Trust Fund as the saving grace to the system. You can read this article to learn the fallacy of this belief. There are a couple of other facts in the report which might cause concern. In 2011, the government collected $691 billion of Social Security Taxes and paid out $736 billion in benefits. It appears there was a $45 billion shortage in 2011, but there wasn’t. The Social Security Administration collected $111 billion of interest on its IOU’s from the US government, so it reported a surplus of $66 billion, rather than a deficit. So where did the $111 billion of interest come from? It’s part of the $1 trillion of additional debt the U.S. Treasury issued over the past year. It’s easy to get lost and confused by the Federal government’s accounting methods, which may be intentionally arcane. So here is the bottom line… call it what you want, but the U.S. government borrowed an additional $45 billion to pay out Social Security benefits in 2011. If you read the report and analyze the projections, you’ll see this number is only going to grow exponentially over the next two decades. What is it going to take to change the situation? I really don’t know if we’ll ever realize what’s happening as long as the government keeps sending out checks. But what happens if they stop? It’s unlikely to occur, at least for a long time, but what would have happened if the U.S. Treasury wasn’t able to borrow the additional $45 billion? Since there are no real assets in the Social Security Trust Fund, $45 billion in checks would not have been sent. So in essence, it’s like we’re stuck in our own Social Security Groundhog Day, but there is a difference between us and the character Phil Connors; Phil Connors recognized he was stuck and tried to change it. Sadly, most of us don’t believe we’re living our very own Groundhog Day.